2 of 4 Cut bread into small cubes. Place cubes on a rimmed baking sheet and coat with nonstick cooking spray, then sprinkle with cinnamon chipotle season. Bake at 375 degrees F for 10 minutes or until golden brown. Remove from oven and cool. 3 of 4 Heat cranberry sauce and orange juice in a small saucepan over medium-high heat for 3 minutes, or until boiling. Remove from heat and allow to cool. When cool, strain cranberry mixture into a large bowl with a fine mesh strainer. Whisk vinaigrette, sugar and salt into cranberry mixture and set aside. 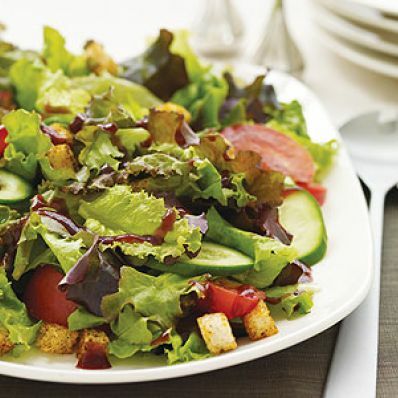 4 of 4 Place salad mix, tomato and cucumber in a large bowl and drizzle with cranberry dressing. Toss with croutons and serve. Per Serving: 0 g sat. fat, 0 mg chol., 194 mg sodium, 2 g fiber, 1 g Fat, total, 26 g carb., 2 g pro., 121 kcal cal.